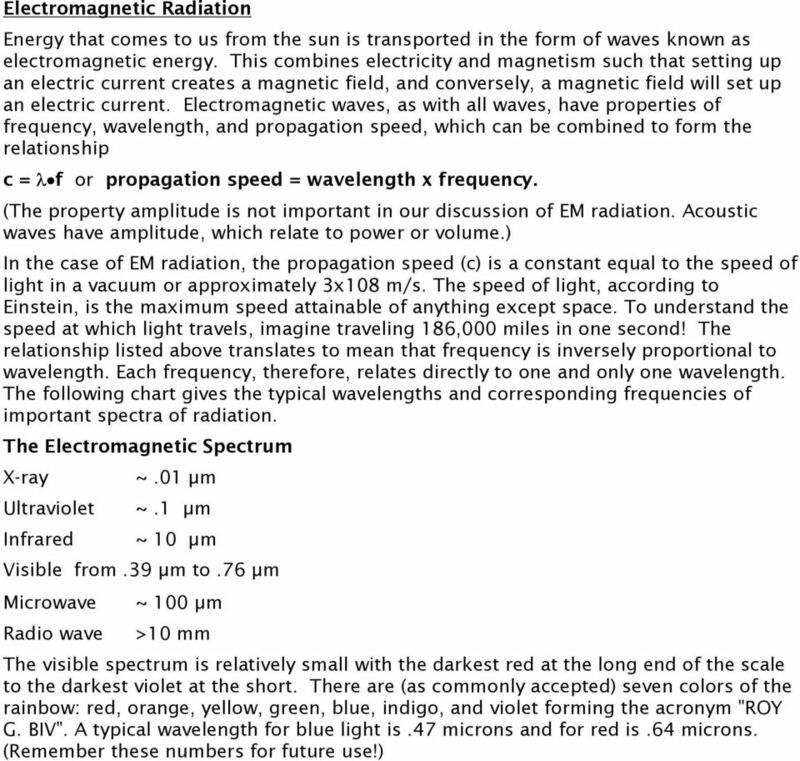 Download "Electromagnetic Radiation Energy that comes to us from the sun is transported in the form of waves known as electromagnetic energy." 2 The Sun As we have said repeatedly, the sun is the ultimate source of our weather. Taking that statement one step further, we will find that it is the unequal heating of the earth that creates pressure imbalances, and thus creates winds. But since it is the sun that is so important, we must first understand the nature of the sun and the energy it gives us. Distance The sun is 93,000,000 miles away from the earth. It takes light over eight minutes to travel that distance. A car traveling 60 mph, 24 hours a day would reach the surface of the sun in 200 years, assuming it doesn't vaporize! Radius The radius (the distance from the center to the surface) of the sun is 870,000 miles or 1.4 million km! This compares to the earth's radius of 6400 km. Energy The sun is composed of helium (He) and hydrogen (H 2 ). Acting like a nuclear reactor, hydrogen fuses into helium, a process known as fusion. 4 x 10 6 tons of mass is being converted to energy every second. Remember E=mc 2? At that rate we only have 100 billion years left (10 11 ). Most of our energy comes from a shell of gas 500 km thick surrounding the sun known as the photosphere. Mass Relative to the earth, the sun is 329,390 times more massive. Temperature The temperature of the sun is 5780 K. This compares to the temperature of the earth which is 15 C or 288 K. In other words, the sun is 20 times hotter than the earth. 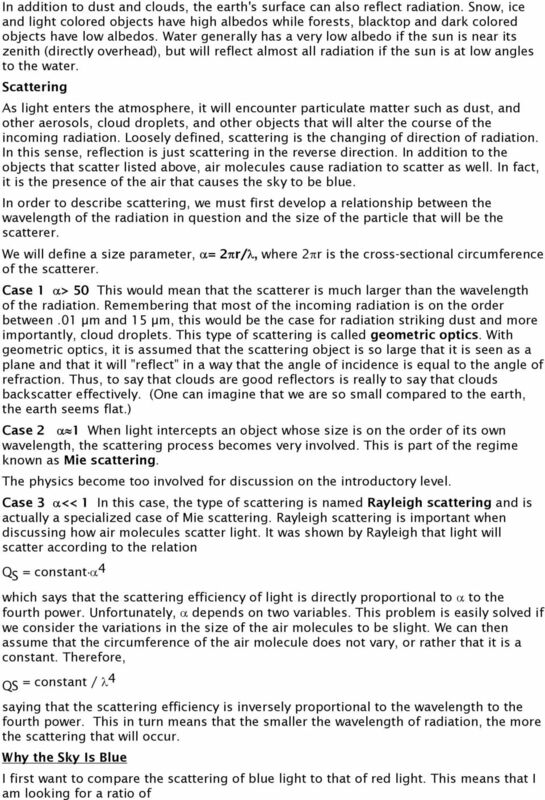 3 Blackbody Radiation Blackbody - a hypothetical body consisting of a sufficient number of molecules absorbing and emitting electromagnetic radiation in all parts of the electromagnetic spectrum so that: a) all incident radiation is completely absorbed; and b) in all wavelengths bands and in all directions (isotropically), maximum possible emission is realized. Although a blackbody does not really exist, we will consider the planets and stars (including the earth and the sun) as blackbodies. Even though by definition, they are not perfect blackbodies, for the sake of understanding and simplicity we can apply the characteristics of blackbodies to them. According to the above definition, a blackbody will emit radiation in all parts of the EM spectrum, but by intuition, we know that one will not radiate in all wavelengths equally. 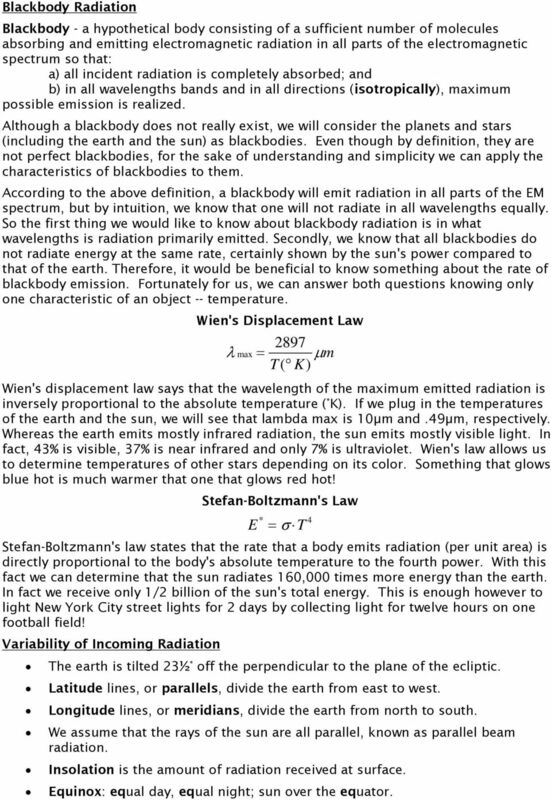 So the first thing we would like to know about blackbody radiation is in what wavelengths is radiation primarily emitted. Secondly, we know that all blackbodies do not radiate energy at the same rate, certainly shown by the sun's power compared to that of the earth. Therefore, it would be beneficial to know something about the rate of blackbody emission. Fortunately for us, we can answer both questions knowing only one characteristic of an object -- temperature. Wien's Displacement Law 2897 λ max = µ T( K) m Wien's displacement law says that the wavelength of the maximum emitted radiation is inversely proportional to the absolute temperature ( K). If we plug in the temperatures of the earth and the sun, we will see that lambda max is 10µm and.49µm, respectively. Whereas the earth emits mostly infrared radiation, the sun emits mostly visible light. In fact, 43% is visible, 37% is near infrared and only 7% is ultraviolet. Wien's law allows us to determine temperatures of other stars depending on its color. Something that glows blue hot is much warmer that one that glows red hot! Stefan-Boltzmann's Law E * = σ T 4 Stefan-Boltzmann's law states that the rate that a body emits radiation (per unit area) is directly proportional to the body's absolute temperature to the fourth power. With this fact we can determine that the sun radiates 160,000 times more energy than the earth. In fact we receive only 1/2 billion of the sun's total energy. This is enough however to light New York City street lights for 2 days by collecting light for twelve hours on one football field! Variability of Incoming Radiation The earth is tilted 23½ off the perpendicular to the plane of the ecliptic. Latitude lines, or parallels, divide the earth from east to west. Longitude lines, or meridians, divide the earth from north to south. We assume that the rays of the sun are all parallel, known as parallel beam radiation. Insolation is the amount of radiation received at surface. Equinox: equal day, equal night; sun over the equator. 4 Solstice: the sun is furthest from the equator. 23½ N is the Tropic of Cancer; 23½ S is the Tropic of Capricorn. The path of the earth's orbit around the sun is elliptical. Its nearest point in January is 91 million miles away and is called the perihelion (near sun). Its farthest point in July is 96 million miles and called the aphelion. During the aphelion the earth travels the slowest, while during the perihelion, the earth travels fastest. The amount of insolation varies with season and latitude. Averaged, the northern and southern hemispheres receive the same amount of insolation each year as proved by Alexander von Humboldt, despite the variations in earth-sun distance. There is about a one-month lag between the longest day and the warmest day (or shortest and coldest days). This is caused by the temperature responding to the balance of incoming vs. out-going radiation. The spring season is retarded because of the energy needed to first melt the snow and ice. The basic cause of the weather is that the poles are cold and the equator is warm (due to angle of incidence) and the atmosphere attempts to find a balance. 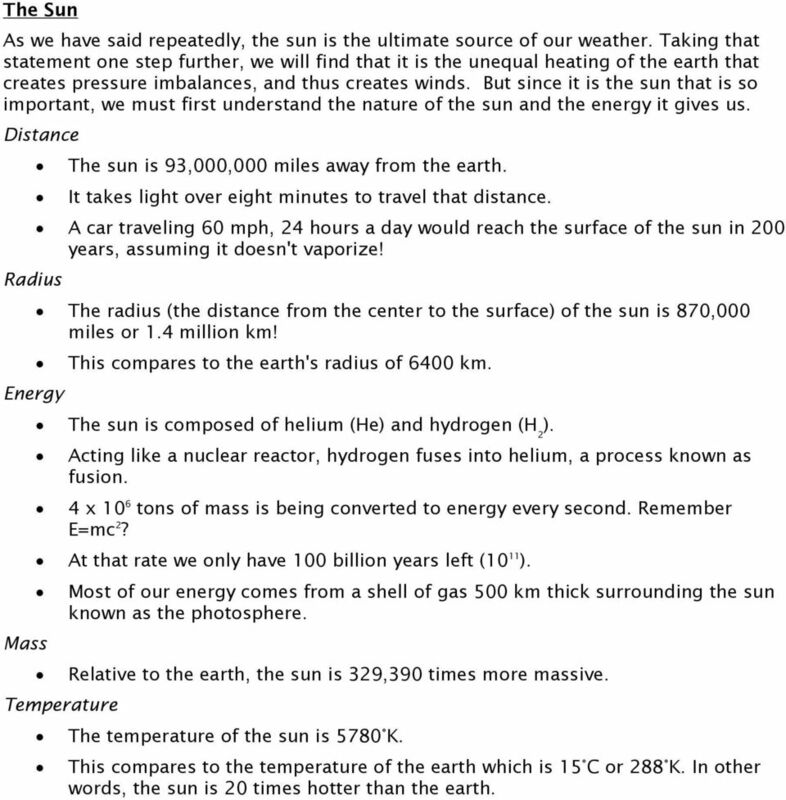 The earth is differentially heated by the sun because the earth is a sphere. 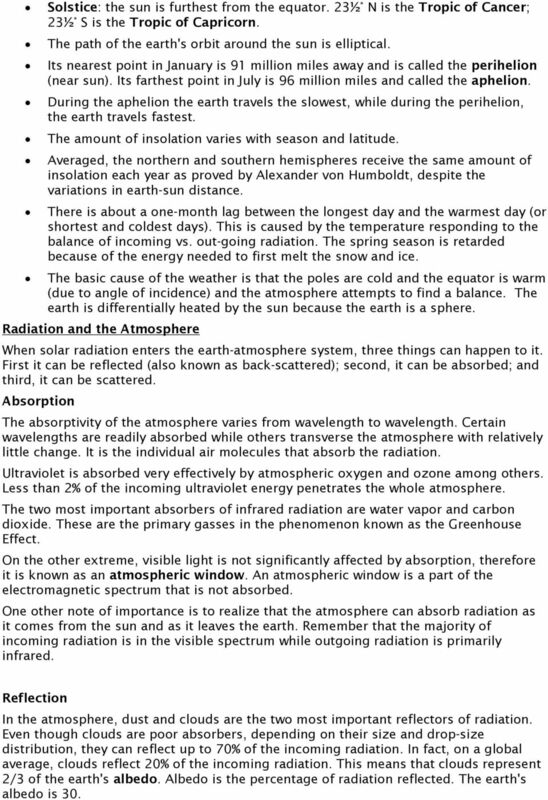 Radiation and the Atmosphere When solar radiation enters the earth-atmosphere system, three things can happen to it. First it can be reflected (also known as back-scattered); second, it can be absorbed; and third, it can be scattered. Absorption The absorptivity of the atmosphere varies from wavelength to wavelength. Certain wavelengths are readily absorbed while others transverse the atmosphere with relatively little change. It is the individual air molecules that absorb the radiation. Ultraviolet is absorbed very effectively by atmospheric oxygen and ozone among others. Less than 2% of the incoming ultraviolet energy penetrates the whole atmosphere. The two most important absorbers of infrared radiation are water vapor and carbon dioxide. These are the primary gasses in the phenomenon known as the Greenhouse Effect. On the other extreme, visible light is not significantly affected by absorption, therefore it is known as an atmospheric window. An atmospheric window is a part of the electromagnetic spectrum that is not absorbed. One other note of importance is to realize that the atmosphere can absorb radiation as it comes from the sun and as it leaves the earth. Remember that the majority of incoming radiation is in the visible spectrum while outgoing radiation is primarily infrared. Reflection In the atmosphere, dust and clouds are the two most important reflectors of radiation. Even though clouds are poor absorbers, depending on their size and drop-size distribution, they can reflect up to 70% of the incoming radiation. In fact, on a global average, clouds reflect 20% of the incoming radiation. This means that clouds represent 2/3 of the earth's albedo. Albedo is the percentage of radiation reflected. The earth's albedo is 30. 6 Q S (blue)/q S (red). Recalling that a typical wavelength of blue light is.47µm and for red it is.69µm, we can solve the above equation to find the answer of 3.5.This translates to mean that blue light scatters 3.5 times more efficiently than red light, which is the principle reason that the sky is blue. However, keeping in mind that the shorter the wavelength the better it will scatter, why isn't the sky violet? The answer is three-fold. First of all, there is more blue than violet in sunlight; second, our eyes are more sensitive to blue than to violet; and third and most important is the fact that all of the colors scatter somewhat. What we see is actually a combination of all the colors blended together, in varying amounts, known as "sky blue". It is that color which is directed toward our eyes after being scattered several times by the molecules of air. Why the Sun Is Red at Sunset. At sunset, the sun's rays are penetrating a thicker slice of the atmosphere allowing more time for the rest of the colors to scatter "out" of the sun. Red light scatters the least and consequently, it is the only color that remains to make the sun visible. Radiation Budget The radiation imbalance is solved by considering two other methods of heat transfer: conduction and convection. Conduction is the transfer of heat from a warm object to a cooler object through contact, or the "touching" of the substances through which sensible heat is transferred. Convection is the transfer of heat within a fluid by fluid motions. Frequently, convection refers to vertical motion, which relates to the hydrologic cycle where latent heat is transferred in effect from the surface to the atmosphere. 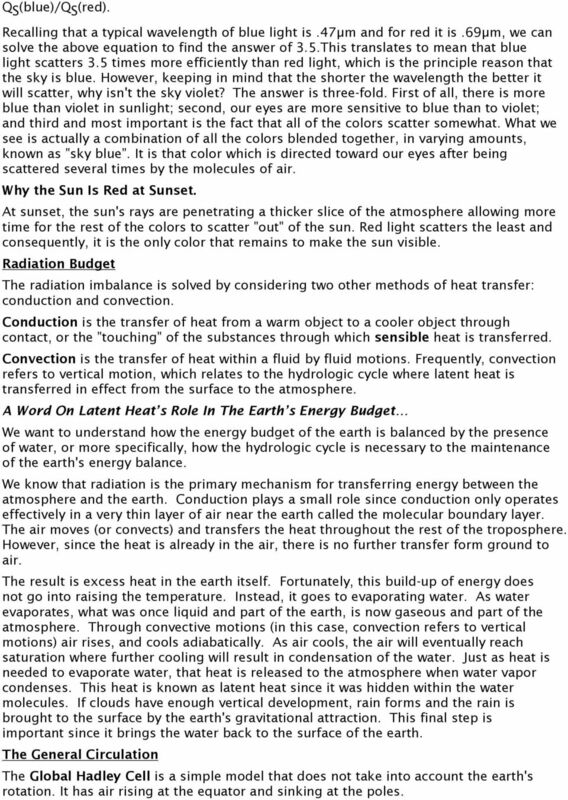 A Word On Latent Heat s Role In The Earth s Energy Budget We want to understand how the energy budget of the earth is balanced by the presence of water, or more specifically, how the hydrologic cycle is necessary to the maintenance of the earth's energy balance. We know that radiation is the primary mechanism for transferring energy between the atmosphere and the earth. Conduction plays a small role since conduction only operates effectively in a very thin layer of air near the earth called the molecular boundary layer. The air moves (or convects) and transfers the heat throughout the rest of the troposphere. However, since the heat is already in the air, there is no further transfer form ground to air. The result is excess heat in the earth itself. Fortunately, this build-up of energy does not go into raising the temperature. Instead, it goes to evaporating water. As water evaporates, what was once liquid and part of the earth, is now gaseous and part of the atmosphere. Through convective motions (in this case, convection refers to vertical motions) air rises, and cools adiabatically. As air cools, the air will eventually reach saturation where further cooling will result in condensation of the water. Just as heat is needed to evaporate water, that heat is released to the atmosphere when water vapor condenses. This heat is known as latent heat since it was hidden within the water molecules. If clouds have enough vertical development, rain forms and the rain is brought to the surface by the earth's gravitational attraction. This final step is important since it brings the water back to the surface of the earth. The General Circulation The Global Hadley Cell is a simple model that does not take into account the earth's rotation. It has air rising at the equator and sinking at the poles. 7 The 3-cell model has air rising at the equator and at 60 and sinking air at 30 and 90 (poles). It contains the Polar Cell, the Ferrell Cell and the Tropical Hadley Cell. Convergence is coming together. Divergence is going apart. Subsidence is sinking air. The winds are deflected by the Coriolis force. The Coriolis force deflects moving objects to the right in the NH and to the left in the SH. Polar winds are the polar easterlies. Mid-latitude winds are the prevailing westerlies. Tropical winds are easterly in the NH (SH) they are called the Northeast (Southeast) trade winds. The ITCZ or inter-tropical convergence zone is an area dominated by surface lows and thunderstorm development. These "hot towers" pump latent heat high into the troposphere where that heat is transferred poleward. Lesson 4 The Seasons. There are 5 major zones on the earth. Name Period Date Unit 5 Test: Earth-Sun-Moon System. 1. The diagram below shows the relative positions of Earth and the Moon and rays of sunlight. Name Period Date Unit 5 Test: Earth-Sun-Moon System Multiple Choice: 30 questions at 2 points each (60 points) 1. The diagram below shows the relative positions of Earth and the Moon and rays of sunlight. Section 12.2 Weather Systems Weather results when air masses with different pressures and temperatures move, change, and collide as a result of uneven heating of the Earth combined with the Earth s rotation. 9 Heating and Cooling Introduction to Chapter 27 What process does a hot cup of coffee undergo as it cools? How does your bedroom become warm during the winter? How does the cooling system of a car work?